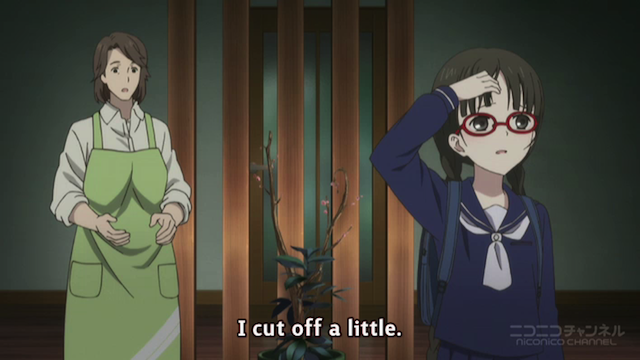 Izumiko, the shrine temple maiden cuts her hair. Just a quick comment on the preview episode of Red Data Girl. As I mentioned in my Spring 2013 season preview post, RDG, or Red Data Girl looks promising. P.A. Works is quite capable of making a quality visual experience, and even this preview that was posted in a low-quality format online is evidence of that. With Hanasaku Iroha, they also demonstrated that they can establish a great setting. The basic setting here seems well thought out, and the basic idea is intriguing, if not extremely original (shrine temple maiden lives sheltered life, then discovers she has special powers). I liked the way they mix technology in with her miko powers. This was just a first episode, but I think things are off to a good start. I don’t know if RDG can deliver an interesting story, but I’ll certainly give it three or more episodes to make it’s case. I can’t remember the name of the show, ATM, but there was a show about a season back in which a girl finds out she has inherited temple maiden powers, and some guys have to protect her from bad guys. This one is off to a much better start, however. As for her powers, I wonder what is going on there as well. It can’t be just technology related, because then they couldn’t have had them in the olden days. That was it. Fairly un-memorable, although I dropped it after about 4 episodes, so maybe someone who really watched it should comment. Anyway, this isn’t a particularly original concept, but so far it looks like they are doing a good job, so I’m looking forward to seeing more of it. I am very much looking forward to this. I wanted to look at the pre-airs, but don’t mind waiting until the 4th. Sort of odd though that they would release three episodes of it already. It turned out to be a mini-story that gives you a feel for what the world is like, and some insight into the main character, but takes place before what looks like the main show show begins. Actually did a good job of getting me interested in watching the series, although I was intrigued enough to watch it before seeing the webcast. Oh, so it is like an prologue of sorts? Makes sense. I wanted to myself, but might was well wait for it, since it is only a day away and wanted to see it in the best quality possible. Yes, like a prologue. I bet it will look great in full resolution; I plan to rematch it when the real broadcast begins so I can get the complete experience.